The brisk morning fog rolls in as Jessica Blakley makes her way along the stretch of winding, tree-lined roads to Stahlbush Island Farms. The truck’s heater blasts over the sound of the early morning radio, telling listeners that Corvallis can expect temperatures as high as 90 and sun all day long. Rounding the last corner, Stahlbush Island Farms’ main farm comes into view. Rolling hills backed by hundred-year-old trees decorate the horizon and frame the early morning sunrise. Jessica pulls up to the gravel parking lot behind her office, grabs her backpack, phone, sunglasses, and of course, coffee. Jessica, a Field Representative here at Stahlbush Island Farms, starts off every morning earlier than most. By 7am, she has her young daughter dropped off at daycare, paperwork delivered to the office, and is out in the fields checking on crops. Jessica and the other field rep, Craig Agidius’ main responsibility this time of year is checking each crop in each field to see if it is ready for harvest. During slower times, she and Craig, who recently graduated OSU, plan where each crop will be planted, determine how much needs to be grown to meet sales goals, and schedules planting, harvesting, and processing up to a year in advance. Jessica and Craig pull samples from each field, and look for things like color, taste, moisture-level, and appearance to see if the crop is ready to be harvested. Every day she travels to 10 or more fields across the Pacific Northwest, stopping only occasionally to refill her Dutch Bros. 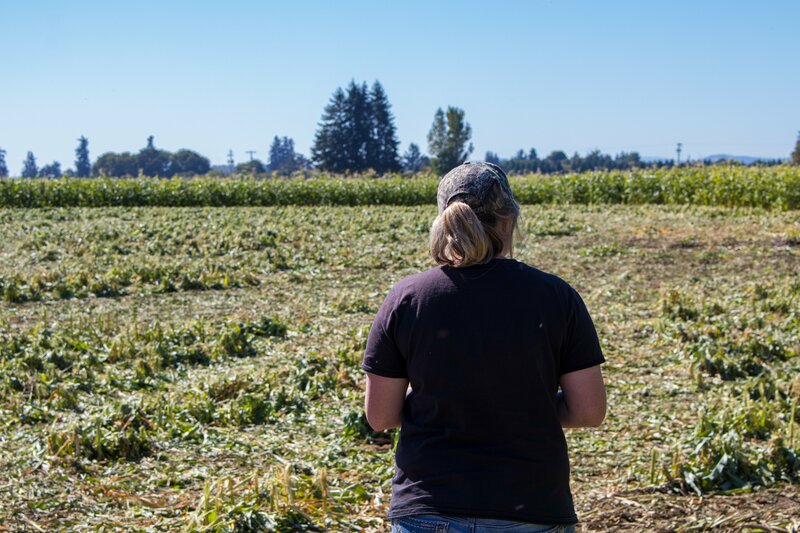 This morning, Jessica ventured out to the corn, butternut, and pumpkin fields to see how harvest was going on pumpkins and butternut, and to check on the corn maturity. She weaves in and out of corn stalks beneath the perfect blue, Oregon summer sky. Plucking a few pieces of corn off the stalk, she brings them back into the sun and peels away the husk to reveal the untouched, sweet yellow corn kernels. She explains how the hair on the top of each piece of corn can tell you whether or not the plant has been pollinated. “If the corn silk is brown, that means it was pollinated. But if it’s white, then it hasn’t been pollinated and the yellow kernels haven’t yet developed. Unlinke pumpkin that require bees to pollinate the crop, corn relies on wind to do the pollination,”. Each silk is connected to a kernel, and tells a story about how the corn grew, was pollinated, and matured to become the corn we see in our Stahlbush bags. At the squash field, the unmistakable “plunk” sound of pumpkins falling into the bin rings out across the landscape. Each tractor shakes the pumpkin free from its vines, scoops it up, and deposits it into the truck bin which takes off for the main farm to be processed when full. Stahlbush pumpkins, unlike Jack-o-lantern pumpkins, are striped and have thicker, more spongy walls which make them perfect for pureeing. Jessica grabs her knife and splits a pumpkin in half to show how Stahlbush pumpkins naturally have less seeds, which we save and replant for next year’s crop. “You can tell when the pumpkin is ripe by the color of the seeds,” she explains, “when the seeds are translucent and grey, the pumpkin isn’t quite ready. But when the seeds are firm and solid white, it means the pumpkin is ready for harvest”. After a long drive back to the farm, Jessica’s day is nearly over. At 4:30pm, she is wrapping up emails and paperwork, and scheduling meetings with her team. On her way out of the office, she passes the butternut field on the main farm, snaps a photo of Mary’s Peak rising up out of the clouds and the sun illuminating each leafy row of golden squash. She winds her way back through Stahlbush’s long drives, already ready to start it all again tomorrow.